Tired of fumbling around with a needle and thread when trying to hem your jeans or quickly fashion a set of curtains, pricking yourself along the way as you struggle through hours of work? Step up your sewing a few notches and speed up the process with a new electronic or computerized sewing machine. Whether you make your own clothing or just need something for the occasional alteration, you’d be surprised at how much time you can save while expanding your wardrobe. Whatever kind of sewing machine you are looking for, we’ve got one to fit your needs. After reviewing dozens of top-selling models, we narrowed the list of best sewing machines to only these 12 top-rated options. The following table makes a good starting point when figuring out which might suit you best. This machine offers 130 stitch types, plus monogramming that includes special characters in addition to letters and numbers. It’s lightweight and can easily be transported from one place to another. The light weight of this machine means that its motor probably isn’t very strong. Heavy-duty jobs may cause the machine to struggle and it may not stand up to prolonged tasks. A great option for people who are just getting started in the quilting and sewing world. But this is not for those who will use the machine often or for long periods of time. Twelve stitches and three presser feet will meet all of your basic garment-sewing needs with this well-built machine. A lack of special stitches, monogramming, and automated features mean that this machine is not cut out for the advanced needs of serious tailors. Near the lower end of the price-range on our list, this Janome has a decent range of stitches and presser feet for accomplishing most tasks. Built to handle regular heavy use, this machine will stand the test of time thanks to its sturdy frame and well-made parts. A few special features make it even more appealing. With only 11 stitches, this isn’t likely to be the quilter’s dream machine and will be best suited to people who don’t have intricate monogramming in mind. If you’re looking for a basic machine at an affordable price, but want top quality in terms of durability, this Singer has got you covered. A total of 60 stitches, 9 presser feet, automatic stitching, speed control, and an easy-to-read LCD display panel with push button functions are some of the things that elevate this machine above its similarly-priced competitors. This machine lacks a few advanced features, such as automatic backstitch and an automatic thread trimmer, but it’s hard to be disappointed considering its other abilities and its very fair price. Though this machine is impressive in terms of what it can do, it is best for those who intend to use it only occasionally and not those who make a living through their sewing projects. A strong, sturdy frame, a heavy-duty motor, and interesting presser feet allow you to create creative masterpieces with this lightweight machine, even when used over extended periods of time. Very few stitches are included with this machine, which means that inexperienced tailors might struggle with it. If you are an expert seamstress and need a lightweight machine capable of going the distance, this machine is built for you. This machine comes with a variety of presser feet, is strong and durable, and can handle regular use by avid sewers. Does not have some of the fancy functions and stitches that you can easily find on much cheaper machines. If quality is what you are looking for but you aren’t quite in the market for a $1,000 professional machine, this basic, durable, mid-priced option may be what you need. The cheapest on our list, this affordable machine comes with 3 presser feet, a 4-step buttonhole creation system, and 6 stitches (including a decorative scalloped stitch). Overall, it’s a well-built machine. Unfortunately, this machine is not equipped for fancy designs, embroidery, and monogramming; it also doesn’t have advanced functions like an automatic thread trimmer. If you need a small, uncomplicated machine for basic sewing, you will be hard-pressed to find a better quality machine at such a budget-friendly price. With a total of 18 stitch options, 5 snap-on presser feet, a top-load bobbin system, and a hard plastic carrying handle, this portable sewing machine goes beyond basics. This machine fails to offer bonus options like automatic backstitch, automatic needle threading, and automatic thread cutting. Overall, if you need an above-basic (but not professional-quality) machine that’s highly portable and easily storable, this one just may be what you’re looking for. A multitude of features and functions set this machine apart from many of the others in this list. Its easy-to-use computerized interface makes high-quality designs accessible to beginners. Though it has the design capacity that professionals need, it is probably not strong enough to withstand use on a regular, daily basis. For the casual and leisurely sewer, it will be harder to find a more versatile machine at a better price. This machine has earned its title of “Best Value”. At an affordable price, this small sewing machine is built to impress despite its compact size. It includes over 100 stitches, 10 presser feet, multiple buttonhole types, and a few automatic functions. Built-in monogramming patterns, like those found on some of the other machines, are not part of the package with this one, nor is an automatic thread trimmer. If you’re looking for an economical, compact machine capable of many stitches, you can’t do much better than this one. If, however, you absolutely need the few missing functions, you may want to keep looking and increase your budget. With almost 30 pre-set stitches, 7 easy-to-change presser feet, an automatic needle threader, a drop-in bobbin, and a very competitive price, it is no wonder that this is one of the most popular sewing machines on today’s market. A small motor and modest overall size mean that this machine simply isn’t up to large tasks and won’t satisfy professional seamstresses. If you like to sew at home and tackle a few creative projects over the course of a month or a year, this machine offers good value. Chock full of advanced features like built-in embroidery templates, automatic functions, and the ability to be hooked up to a computer, this is a very impressive machine. Though the advanced features are wonderful for some people, they may be a little more than a beginner can handle and might serve only to complicate the sewing process for some people. 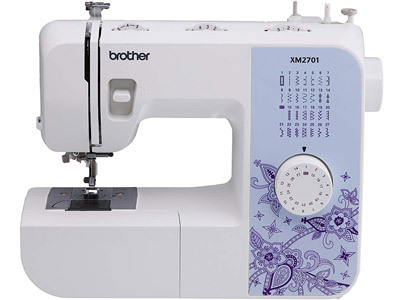 If you’re ready to take your sewing and embroidery to the next level, this Brother machine is a perfect choice. In creating the following reviews, we scoured the internet for the absolute best assortment of sewing machines. We wanted to bring you machines suitable for everyone, from the absolute beginner to the full-time professional. In doing so, we looked at hundreds of products and thousands of consumer ratings. The reviews below are based on our research regarding the various aspects of each machine: the number and type of stitches it can create, how many different presser feet it has, any special convenience features, its overall level of durability, as well as the general impressions expressed by actual users of these machines. Infrequent or beginner quilters who need a machine capable of handling heavy fabrics and able to create many different fonts and designs. Anyone who just needs a basic machine for stitching garments, or people who need something heavy-duty for frequent use. This partially computerized sewing and quilting machine will impress even the most dedicated seamstress. You can see at a glance that it incorporates 130 different stitches and comes with 8 different presser feet. Though Brother considers these to be its major selling points, you will see that it packs a number of other qualities worth noting. 130 stitch types allow you to create almost any design you can imagine. This wide array of stitches is what makes this a “quilting” machine rather than a typical sewing machine. To perform simple sewing functions (creating clothing, hemming draperies, etc. ), you don’t really require much more than a straight stitch and a zigzag stitch. When you’re quilting, however, the extra stitches become much more important. They will allow you to be much more creative and decorative with your quilt designs. This machine is capable of regular garment stitches, monogram letter stitches (including multiple special characters), and many specialty quilting stitches. Different types of presser feet allow you to perform different tasks. The feet included with this machine are: zigzag, buttonhole, overcasting, monogramming, zipper, button fitting, blind stitch, and a regular foot. Simple buttons allow you to choose between the different types of stitches this machine is capable of. You can see your selection on the machine’s small digital screen. This machine is a little low-tech compared to – for instance- the SINGER 7258. Instead of allowing you to use a large touch-screen display like some extremely high-end models (which we decided not to review), this machine requires that you press buttons to make your selection. It also utilizes a “flip chart” of stitches. This chart is basically a printed catalog of available stitches, along with their assigned numbers, so that you can select the stitch you need by pressing buttons until you see its number on the display panel. There are so many stitches to choose from (130 in total) that they wouldn’t all fit into the space designated on the outside of the machine, so Brother was forced to print them on a special panel. After doing considerable research into consumer feedback, we’ve come to the following conclusions. This machine handles heavy fabrics and multiple layers of fabric very well. In fact, people have loaded it up with three layers of heavy fabric and found that the machine didn’t struggle one bit. Still, more than three layers, or trying to sew a material like leather will probably cause problems. Consumers also say that this machine works well with elastic materials like spandex. Since it weighs very little, it’s easy to move from one place to another. Unfortunately, this is probably a sign of a small motor. This tells us that it may not be as durable as some of the heavier machines on this list, since big motors are generally tougher and less prone to overheating. Its lightweight frame and motor make it easy to carry. A total of 130 stitches with additional monogramming options mean that this machine can handle a wide range of projects. Eight presser feet allow you to select whichever one is perfect for your sewing task. It is likely that this machine doesn’t have a very large or strong motor, meaning that it won’t be able to handle prolonged use without overheating. 130 stitches allow you to create almost any design you can imagine. This wide array of stitches is what makes this a “quilting” machine rather than a typical sewing machine. Anyone who wants a well-built yet no-frills sewing machine without special stitches or computer screens. People who need automated functions like monogramming, auto-threading and auto-tie-off. This machine includes a total of 12 pre-set stitches – fewer than those offered on other comparatively priced machines. It is important to remember, though, that a large number of stitch types is only one aspect of a sewing machine’s usefulness. The Brother HC1850, for example, while costing roughly the same and offering many more stitch options, is very lightweight, which means that it has a small motor incapable of handling difficult jobs or running for long periods of time. By contrast, users report that this Janome is fully capable of handling heavy fabrics and working with them for extended periods of time. So, while you will miss out on the versatility numerous stitch types provide, increased durability makes up for this. Unlike half of the sewing machines on our list, this one is not computerized at all. There are no fancy buttons to push to select your favorite stitch. There’s no LCD display screen to display the settings you’ve chosen. Instead, like more traditional machines, this one relies on dials for stitch and length selection. Thankfully, these are very easy to read and understand. Choosing a letter between A and G allows you to select your stitch on one dial. By moving another dial along the continuum of 0 to 5.5, you can select your ideal stitch length. Some people will prefer a fully computerized model with a large touch screen that allows you to more or less set it up and walk away. (We don’t have any of those on this page, as the balance between their cost and functionality don’t make them all that practical for domestic use). Others prefer semi-computerized machines that allow you to choose among several preset functions and patterns. The truth, though, is that people who just want to perform basic sewing really only need basic functions and stitches. A computer screen would really be more of a luxury than something which is really necessary or even all that useful. An easy-to-use reverse lever allows you to change the direction of your fabric to lock your stitches in place. This reverse switch is not preset to move backward and then forward a certain number of stitches – the control is completely in your hands. Whether this is something you prefer or not depends on the type of jobs you regularly complete and the level of automation you’re used to. Reviewing the comments left by actual users on various websites, we’ve found that most responses are quite positive. Consumers state that this is a good machine for beginners and veterans alike. Of course, as we have also stated, this isn’t the best choice for anyone with intricate projects which require specialty stitches and a large assortment of presser feet to complete those jobs. For the most part, consumers say that this machine holds its own among other basic machines in its price range. They praise its durability and ability to handle significant weights of material, provided that the correct needles are used for these applications. This machine has the ability to handle difficult materials. Twelve stitches offer some options, as do adjustable stitch width and length. Three different presser feet, with the option to buy more, allows you to tackle difficult tasks like buttons and zippers. This machine does not have a monogramming function or fancy stitches you might need for intricate projects. Having no automated functions means that everything aside from the basic task of sewing will need to be completed manually. Like more traditional machines, this one relies on dials for stitch and length selection. Thankfully, these are very easy to read and understand. Anyone looking for a durable, portable, well-built machine at an affordable price. People who need special stitches, monogramming, or a bunch of automatic functions. Are you someone who sews a lot but typically sticks to basic stitches for garments or simple sewing jobs? If so, you probably want a basic yet durable machine. You don’t need a ton of stitches for fancy quilting jobs, you just need a handful of stitches – enough to make sure you can complete your projects without overcomplicating things. This unit is not likely to break down on you halfway through a project, which can’t be said of all similarly-priced machines on the market today. Why is that? Singer chose to make this sewing machine with quality parts, a sturdy interior metal frame, and a powerful motor instead of offering special stitches and a computerized read-out. In other words, this sewing machine trades some advanced functionality for better old-fashioned durability. Frequent sewers often have to transport their machines from one place to another. This machine’s solid plastic handle makes it easily portable. If you like, you can also purchase an optional carrying case with a reliable metal clasp lock. The carrying case also serves as a dust cover for people who don’t use their machines often. In case the fair price, upscale construction, and handy carrying case aren’t enough for you, this machine also has a few more intriguing features. Firstly, each step of the threading process is labeled with a number so that you can easily thread the machine from spindle to needle without missing a step. Second, a top-load bobbin system allows you to place the bobbin into its fitting with a minimum of fuss. Most other machines require you to pull out a small lever on the bobbin to hold everything together as you carefully place it sideways into the bottom of your machine. What’s more, this system features a clear lid so that you can see exactly how much thread is left on your bobbin without having to open the entire thing up. If you’ve ever run out of bobbin thread halfway through a seam, you’ll know how important this minor feature truly is. If you like the look of this machine and prefer quality over flash, but still need a little something extra in terms of stitches and features, you may want to take a little time to look over its sister models – the Singer 4423 and the Singer 4432. While both are built similarly to this one, the 4423 has 12 more stitch options and an automatic needle threader. The 4432 offers 22 additional stitches and an automatic needle threader as well. A clear bobbin panel allows you to see how much thread is left on it. The bobbin loads from the top, making the process much easier. 4 presser feet and an automatic buttonhole function make this a great option for garment sewing. A convenient handle and separately-sold carrying case allow you to transport and store this machine with ease. Automatic threading and tie-off are not part of this basic machine’s repertoire. This machine has fewer stitches, which limits the types of task it can perform. A top-load bobbin system allows you to place the bobbin into its fitting with a minimum of fuss. What’s more, this system features a clear lid so that you can see exactly how much thread is left on your bobbin without having to open the entire thing up. People who aren’t able to press down on a foot pedal or are happy to let the machine do all the work for them. People who like a basic machine without too many fancy options. This machine features an automatic needle threader. Though this is a cute little extra, what is even more useful is its automatic button holder. What’s most impressive, though, is the fact that this machine can practically run on its own. Thread the machine, put the bobbin in place, ensure you’re using the proper presser foot, set up your material however you like it, select your stitch, set your stitch width and length, choose a sewing speed, and press “start”. You will hardly need to keep your fabric aligned as it feeds itself through the machine, nor do you have to press your foot down on a pedal. Anyone with foot or ankle problems, or who has trouble maintaining an even pressure on the foot pedal, will love the ease and simplicity of using this machine. A total of nine presser feet can be changed out depending on the task at hand. Few other machines come with this many presser feet. The buttonhole foot, for example, can be used to help you create the perfect buttonhole shape, while the button fitting foot will allow you to work around the actual button with ease. A zipper foot helps you deal with zippers, while a spring-loaded quilting foot adjusts its pressure based on the thickness of your material. All 60 available stitches are clearly displayed on the side panel of the machine so that you can easily enter the number of your desired stitch into the computer panel to adjust it. Unlike some others with computerized panels, this one’s printed panel allows you to see all of your stitch options without having to scroll through an options menu or dig out your instruction manual. Included among the 60 stitch options are seven different buttonhole shapes. Few others offer this many buttonhole options – most are capable of only one basic style of rectangular buttonhole. In fact, the SINGER 9960 Quantum Stylist is the only model on this list which has more buttonhole options. Forget about having to perform basic tasks with your sewing machine where you have to all the intricate work by hand – let this machine shoulder most of the load with its decorative stitches for quilting and embroidery. Not only can you choose specialized stitches, you can also program the machine to create your own designs. Although this isn’t quite as advanced as an industrial machine that can embroider patterns you design using a computer (none of which are featured on our page), this sewing machine can still create things like circles, scallops, and large zigzags. Qualities like these make this machine special among its competition. Finally, a top-load bobbin does away with all of the fuss of trying to hold the bobbin lever out while inserting the bobbin into the machine. The many stitch and automatic options allow you to create intricate projects with minimal effort. The top-loading bobbin is much easier to install and remove. This machine’s affordable price puts top-shelf features within reach of people on a budget. LCD screen shows your stitch selection, displays error messages, and tells you which presser foot to use. A built-in storage compartment holds all your accessories. Unlike some other machines with advanced functions like those featured here, this one does not have auto backstitch or an automatic thread trimmer. This machine can practically run on its own. You will hardly need to keep your fabric aligned as it feeds itself through the machine, nor do you have to press your foot down on a pedal. People who are serious about sewing and anyone who wants to include unique, intricate embroidery in their projects. People with limited budgets looking for machines with push-button functions and multiple stitch options. At first glance, it’s difficult to understand how this machine could possibly have made its way onto our list, given its minimal number of features and very high price. If you take a step back, though, and stop looking for special stitches and fancy display screens, you will see that this is by far the sturdiest, most durable machine we have on our list. Made for the serious hobbyist or the full-time tailor, this Juki is built to impress in terms of its lifespan. It can handle multiple layers of thick fabrics with ease and will run continuously for hours without overheating or jamming. In fact, despite its elevated price, this machine has received the best user reviews overall of any of the options we’ve selected. Without a plethora of fancy stitches and special features, it’s hard for many people to understand why this machine is so expensive and to whom it is being marketed. It’s made for master quilters and seamstresses alike. Whether you simply stitch straight lines of curtain hems all day long and thus need a durable machine, or you prefer to create quilted masterpieces using your own designs instead of the pre-set ones built into some other quilting machines, this is the one you need. Just What Can It Do? Even a quick look makes it clear what this machine cannot do. It can’t, for instance, create varied zigzag stitches or buttonholes or any of those other interesting designs. But just what can it do? Using a simple knob, you can adjust the length of your stitch depending on whatever type of project you are working on. The flick of a switch allows you to move between its two stitching type options. Moving a simple dial near the front of the machine allows you to adjust the pressure of the presser foot. The dial at the back end of the machine allows you to adjust its speed. The simple push of a button allows you to fully insert or retract the needle. A single button push will cut your thread and another button push will switch the machine to backstitch mode. This amount of manual adjustment might seem intimidating to novices, but experienced sewers will appreciate the extra control. Despite being made from the highest quality materials and incorporating a very well-designed, durable motor, this machine is pretty lightweight. You can carry it just about anywhere without breaking a sweat. Most other lightweight options have less powerful motors, which helps keep their weight down but doesn’t make them very good options for people who sew a lot. The strong aluminum die-cast body, while not weighing a ton, is able to take a beating while simultaneously reducing vibrations for a smoother, quieter sewing experience. Equipped with regular presser feet as well as specialized quilting feet, this machine allows you to complete almost any task. While most other machines’ quilting feet strongly resemble ordinary presser feet, this machine’s quilting attachments are more like little loops. Their unique shape allows you to see your work much more clearly because they aren’t covering it as you go. This means that you will be able to create small, intricate embroidery patterns without issue. Built with a high level of durability to handle regular use. This machine is lightweight and easy to carry without compromising its motor’s integrity. Special quilting and embroidery feet allow you to create even the most intricate designs. Without any special stitches or automation, this is not a machine built for beginners learning to quilt. Despite being made from the highest quality materials and incorporating a very well-designed, durable motor, this machine is pretty lightweight. You can carry it just about anywhere without breaking a sweat. People who want a fairly high-quality machine built with longevity and durability in mind, but don’t have the budget or need for a professional-quality machine. Quilters and those who need more than one type of stitch for their projects. When compared to most of the other machines on this list, this Brother quilting and sewing machine has an work area of larger than average size. In fact, only the SINGER 9960 Quantum Stylist with its extendable work surface is even comparable. The extra-large workspace allows you to spread more fabric over the area without it bunching up or falling in strange directions. This makes large projects much easier to maneuver. To most people, this machine won’t look as though it’s worth the price, given that it doesn’t have most of the fancy functions and stitches you find on some of its major competitors. It doesn’t have an abundance of stitch types to choose from nor a monogram setting. It does not allow you to embroider pre-set designs. It doesn’t even have an LCD display screen like the SINGER 7258. What makes it worth its price, then? Well, it does have a few neat bonus features, like an automatic thread trimmer, an automatic needle threader, a knee lever attached to the presser foot, and a droppable feed dog – but those are all things we’ve seen on other machines that don’t cost nearly as much. So, while they are impressive qualities, they aren’t enough by themselves to justify the high price of this machine. What does set it apart from many of the others we’ve reviewed is its overall quality. Instead of spending more on special stitches and embroidery templates, Brother chose to build this particular sewing machine with longevity and durability in mind – similar to the way that Juki built the TL-2010Q. Yet it must be said that this particular machine isn’t quite as dependable as the Juki. While the Juki is built to handle thick, multi-layered fabrics for hours at a time and days on end, and the less expensive machines on this list are intended for only casual use, this machine falls somewhere in the middle. It will last longer than any of the $80-$300 options you’ll find for sale and will be able to withstand a tougher workload, but it isn’t really made for continual use. If you are planning to use your sewing machine on a regular basis and need it to stand up to anything you throw at it, but don’t need to use it professionally or for extended periods, this Brother is worth looking at. Automatic functions like the thread cutter and the needle threader help you get your work done faster. Built to withstand the test of time and hard work. Simple enough that even beginners should be able to handle it with ease. Does not have any special stitches – only basic stitching is possible. Does not have monogramming or embroidery options outside of semi-manual embroidery when feed dog is lowered. The extra-large workspace allows you to spread more fabric over the area without it bunching up or falling in strange directions. This makes large projects much easier to maneuver. People who have basic sewing needs and little space in which to store their machine. People who need time-saving special features like automatic thread trimmers and needle threaders. Unlike many other machines, this one does not feature any special abilities whatsoever. It doesn’t have an automatic needle threader, an automatic thread trimmer, automatic backstitch, monogramming ability, or a top-load bobbin like you’ll see on a number of popular models. However, if all you are looking for is a well-built machine capable of handling all your basic sewing needs, this one should interest you. Smaller than most of the other machines on our list, this Singer is perfect for people without much closet space. You can easily tuck it away in a cupboard or closet when it is out of use and pull it out whenever you need it. Its compact size does have a slight downside, however – it does not have a very large work surface. This means that while it is a great option for anyone who needs a machine for occasional use, it simply is not made for dedicated sewers. Overall, this is a rather basic machine – but what would you expect at this very affordable price? It is by far the most inexpensive option on our list, yet it holds it own among the rest in terms of its build quality. Its strong, sturdy frame keeps it from vibrating even as it struggles through denim – never skipping or missing a stitch. It has a total of six different stitch options, including a four-part buttonhole stitch, an assortment of zigzag stitches, and a decorative scalloped stitch. Three presser feet allow you to accomplish most basic tasks. The all-purpose foot works well for straight and zig-zag stitches. The zipper foot is shaped to work with zippers of all kinds without letting their teeth interfere with the stitching process. The special buttonhole foot ensures that your buttonholes will always be the right size and shape. Its small, compact size makes this machine very easy to store. Its affordable price puts this machine within the reach of most individuals. Comes with three presser feet so that you can perform regular stitching, zipper stitching, and buttonhole stitching with ease. Its small size means that its work surface can be a little confining. This machine is not capable of automatic backstitch, needle threading, or thread trimming. It only has 6 basic stitches and is can’t do monogramming or embroidery. This Singer is perfect for people without much closet space. You can easily tuck it away in a cupboard or closet when it is out of use and pull it out whenever you need it. People in the market for a decent, portable machine they can travel with. Anyone who needs an advanced machine capable of long hours of work or intricate embroidery. This machine’s advanced 7-piece feed dog system lets it move your fabric along easily, regardless of whether it’s heavy canvas or dainty silk. A hard plastic carrying handle is fitted to the top to make the machine portable. This means that you can lock it away in a cupboard and bring it out for occasional use. You can also carry it from one location to another to help loved ones with sewing projects in their own homes. Eighteen stitch options include basic stitches, zigzags, a few decorative stitches,and even a simple buttonhole stitch, allowing you to achieve all of your basic sewing goals. To use the buttonhole stitch, simply set the dial to the buttonhole option, change the presser foot, and let the machine do most of the work for you. Aside from the additional buttonhole foot, this machine also comes with a blind stitch foot and a zipper foot for extra convenience. Another feature we like is its snap-on presser feet design. This makes it possible to change these attachments in a matter of seconds. The convenience doesn’t stop there, though. The advanced top-load bobbin system makes this machine even easier to use. Top-load bobbin systems are still somewhat rare. What makes them so coveted, though, is that this type of design takes a lot of the hassle and guesswork out of sewing. Instead of accidentally running out of bobbin thread halfway through a line of stitches, you can simply glance down into the bobbin area and see exactly how much is left on your spool. Over all, despite its decent price, handful of stitch options and a few special features, this machine doesn’t quite live up to the standard set by some of the others. It doesn’t have a computer readout screen, instead relying on simple push-button controls like a few other decently-priced machines. It doesn’t have monogramming. What it does have, though, is a sturdy build, decent functionality, and a handy carrying handle – as long as you can live with its shortcomings, you won’t be disappointed. The heavy-duty plastic carrying handle helps you transport it from location to location. The 7-piece feed dog system helps you work effortlessly with almost any fabric. Snap-on presser feet can be added and removed with minimal effort. The top-load bobbin means you don’t have to accidentally run out of thread. Its abilities and consumer reviews don’t quite support its price, at least compared to the other options on our list. Another feature we like is its snap-on presser feet design. This makes it possible to change these attachments in a matter of seconds. Beginners and advanced users alike, thanks to a combination of advanced functions and simple controls. Anyone who is going to use it for long periods of time and needs something with industrial durability. This machine has a very advanced design compared to most others we’ve looked, especially considering its price. Hovering around the mid-point of the price range of the machines we’ve listed, this Singer has a set of attributes and capabilities you would expect from a more expensive machine. Not only does it incorporate an easy-to-read LCD display and a ton of pre-set stitches and functions, it also includes an automatic thread-trimmer, drop-in bobbin (with a clear cover like those on a couple other machines), and much more. Its LCD display panel shows your selected stitch, suggested presser foot, speed, length and width of your stitch, as well as a few other things. If you thought that the 130 stitches programmed into the Brother HC1850 was a lot, you’re about to be impressed. This Singer has 600 built-in stitches to choose from. You will never be left wondering how to combine stitches to get the look you desire with this selection at your fingertips. Interested in monogramming and embroidery? By dropping the feed dog, you can stop the machine from pulling the fabric through and move it in any direction you please. This machine can also create custom monograms using pre-loaded alphabetical designs. Unlike most machines with a similar capability, however, this machine knows 5 different fonts, from basic squared letters to script characters, ensuring you can match text to the style of your project. These numbers are certainly interesting, but when we learned that this sewing machine actually has 13 different buttonhole styles, we knew that this one was created for the serious decorator. Fun and elegant buttonhole designs allow you to create beautiful decorative pillows, curtains, duvet covers, and much more. No other machine on this list matches this versatility. Equipped with a total of 19 presser feet (also the highest number of all the models we reviewed), the machine will display the type of foot to use as soon as you select your stitch type. Replacing the foot is a very simple task. Like the easy-change system used on the Brother XM2701, you simply unclip the one and snap the other into place. When the extra presser feet are not in use, you can store them in the special compartment with all of your other small accessories. Completing a large project or finding it difficult to control the foot pedal? You can remove the pedal completely and set the machine up to sew on its own. All you will have to do is press up and down buttons to control the speed, and feed the fabric through the machine in the proper direction. With a total of 600 stitches, including 5 different letter fonts and 13 buttonhole stitches, you should never run out of creative options. A total of 19 presser feet ensure that any job – from simple straight lines to hems, zippers, and even buttonholes – can be completed with ease and precision. The top-load bobbin system with its clear lid allows you to easily load, track, and unload your bobbin. Droppable feed dog allows you to work in any direction, making embroidery much easier. All of these functions at such a low price means that we shouldn’t expect this machine to contain a high-quality, industrial-strength motor. Despite its many great qualities, this machine does not have an automatic needle threader. This Singer has 600 built-in stitches to choose from, but when we learned that this sewing machine actually has 13 different buttonhole styles, we knew that this one was created for the serious decorator.. Anyone who has limited space but does not want to sacrifice versatility and creative options. People who work on large projects and, thus, need a large sewing surface. If you’re looking for a compact sewing machine, but don’t want to give up the ability to do some pretty awesome things with it, you may want to turn your attention to this Singer model. Other compact machines often come with only basic stitches and functions. It’s as though most manufacturers assume that people who prefer small machines aren’t interested in creating intricate works of art. Some people, however, have a passion for sewing but simply don’t have the space to accommodate a large sewing machine. If that sounds like you, you are in luck. Though it doesn’t have as large a workspace as some others, this machine certainly holds its own in terms of controls and functions. You can create unique designs on your garments, curtains, pillow cases, quilts and more with over 100 stitches. Basic stitches and zigzag stitches are, of course, included, but what is more interesting are the many decorative stitches. From scallops to waves to gingham-style stitches and more, you can combine these in any way your imagination suggests. Seven different buttonhole stitches, including a keyhole stitch, allow you to create just the right opening for any type or size of button. This machine comes with a total of ten different presser feet, all of which are designed to make certain tasks just a little bit easier. The regular foot, zipper foot, and buttonhole foot are all self-explanatory. There are also a handful of other special-purpose feet, including the blind hem foot, satin stitching foot, overcasting foot, hem foot and quarter inch foot. What really surprised us, though, is the embroidery/darning foot. By dropping the feed dog and using this attachment, you will be able to create original embroidery designs in a fraction of the time it would take to do by hand. The top-load bobbin system makes it easier than ever to load and unload the bobbin spool. You won’t have to fuss around with the lever and guide as you struggle to see into the side of your machine; instead, just drop it into place. A clear panel covers the bobbin area so you can see how much thread is left on it without having to remove it. Comes with an automatic needle threader. Programmed with 100 different stitches. This machine allows you to create your own custom embroidery using its special embroidery foot. Its small size means that it doesn’t have a large sewing surface, so you may struggle with big projects. This machine does not have a built-in monogramming function. The top-load bobbin system makes it easier than ever to load and unload the bobbin spool. You won’t have to fuss around with the lever and guide as you struggle to see into the side of your machine; instead, just drop it into place. Beginners who want a few nice features but aren’t prepared to try their hands at a more advanced machine. People who need a large sewing machine to handle big jobs or those who like to monogram things. Overall, this model hits all the major convenience notes you’d expect from a modern sewing machine. It has interchangeable presser feet, a bright LED light for your work surface, a handful of helpful pre-set stitches, and a few special extras designed to make your life easier. Its price is also quite reasonable when compared with others of similar quality with similar features. However, this compact electronic sewing machine isn’t likely to satisfy a professional seamstress: it simply doesn’t have the motor or working parts to withstand daily use and heavy-duty projects. On the other hand, if you like to sew leisurely or are a beginner just trying your hand at the craft, this affordable option is likely to appeal to you. There are few things more frustrating than trying to fiddle your bobbin into a tight space only to drop it and watch it unspool as it rolls away from you. This machine’s top-load bobbin system allows you to open the little bobbin panel and simply drop it into its slot. Although the panel over the bobbin is not see-through like the one featured on the SINGER 4411, this machine uses clear bobbins so that you can easily lift the panel away and see how much thread is left on it. A total of twenty-seven different stitch options, including one basic rectangular buttonhole stitch and a handful of ornamental quilting stitches, mean that you can tackle a variety of projects. Though other options are available with as many as 60 or 130 stitches, most people only need two basic stitches and a handful of decorative ones to accomplish most tasks. Your own quilting creativity can fill in the blanks by combining stitches and sewing them into various patterns. Like several other options on our list, this machine comes with six additional presser feet. While some others have more (most notably the SINGER 9960 Quantum Stylist, which comes with an outstanding 19 presser feet) this machine’s presser feet are of the quick-change variety. This means that you simply lift the foot, pop it off, and snap the other in place – no more fussing around with screws! With this machine you will receive a regular foot, buttonhole foot, zipper foot, zigzag foot, narrow hemmer, blind stitch, and button sewing. It has enough pre-programmed stitches to turn your project into something creative and appealing. The drop-in bobbin system removes some of the hassles of setting up. The easy threading system also speeds up the set-up process. The machine’s light weight allows you to move it around with ease. This machine simply is not constructed for long, heavy-duty jobs, but will work well for casual seamstresses. The small size of this machine makes it uncomfortable for sewing large items. Overall, this model hits all the major convenience notes you’d expect from a modern sewing machine. It has interchangeable presser feet, a bright LED light for your work surface, a handful of helpful pre-set stitches, and a few special extras designed to make your life easier. Anyone who enjoys embroidering and would like to move beyond the basic pre-loaded templates. People who are only interested in a basic sewing machine or those prefer to do their embroidery by hand. What sets a fully computerized machine apart from a partially computerized one? There’s more than one way to answer this, but the ability to create entire designs is certainly important to many people. Non-computerized electronic machines can create built-in stitches, as can partially computerized machines. Partially computerized machines take things a step further by giving you a display screen to work with. A fully computerized machine gives you built-in stitches and a computer display screen, with the addition of built-in design patterns and the ability to hook up to a computer for even more design options. With a masterpiece like this one, you can create almost any image your heart desires, and with minimal work on your part. You just dream it, set up your machine, oversee the operation, and voila! No more messing around with needles and embroidery hoops for hours on end. Sixty pre-set stitches allow you to create the trimming, edging, and design work you desire. Seventy pre-loaded embroidery designs allow you to add a variety of flowers, trimming, animals, and much more to liven up your projects. This machine is equipped with a 4 by 4-inch embroidery area, allowing you to make much larger embroidered designs than you could with many other similar machines. Hook the machine up to your computer to add custom designs or download any of the thousands of designs you can find online. Five different fonts allow you to add whatever kind of monogramming or wording you wish. This makes it easy to turn your tea towels, tote bags, aprons, and duvets into personalized pieces of artwork. This machine doesn’t only offer you all of the great stuff listed above, it also comes with many of the same bonuses the other high-end machines we’ve reviewed have. For example, eight different presser feet are included with this machine, including a zipper foot, buttonhole foot, button fitting foot, free-motion monogramming foot, and a few others. Like the Janome Magnolia 7318, the SINGER 7258 and the Brother XM2701, all of these feet clip on and off in seconds, saving you time as you switch between sewing tasks. Seventy pre-loaded embroidery templates allow you to embellish your work in a fraction of the regular time. Being able to hook it up to a computer means that you can embroider just about anything on your project. Automatic functions like an auto needle threader and thread trimmer speed up your work process greatly. Unfortunately, this machine doesn’t appear to be capable of automatic backstitch – surprisinglu, given its advanced abilities. Its advanced functions may be more than a typical person needs. Not all sewing machines are alike, and the best way to illustrate that is by looking at the feature table below. It’s also a great place to start your search for a new product, because if there’s a particular feature that you don’t want to do without, this is the place to check if your preferred sewing machine has that option or not. Purchasing a new sewing machine, whether it is your very first or an upgrade, requires doing a little research. After all, this machine is a tool you will be using to craft some important items you might end up using for years to come. From drapery to clothing, from quilts to hankies – everything you will create with your new machine is art and should be treated with just as much appreciation as any other kind of creative work. Just like a painter must decide which type of paint, canvas, and brush to use, so too must you select the right sewing machine for your goals. This short buying guide will help you find the right machine for your needs. Whether you are planning to perform very basic garment-related tasks, embroidery, quilting, or something else entirely, there is a machine out there that’s right for you; this guide will help you find it. If this is your first machine, you may find that you come across some terms you don’t recognize as soon as you set out on your purchasing journey. To ease this process for you, we have included a quick reference list of basic sewing and sewing machine terminology below. If you aren’t new to the world of sewing, feel free to skip this part of the guide and move down to the next section. A stitch is two loops of thread locked into one another which forms the bond that holds your pieces of material together. Placed beneath the main sewing area, this small spool holds the thread that works its way upward and loops together with the thread coming from the large spool at the top of the machine. Though there are many kinds of fabric on the market today, woven and knit fabrics are the most common general types. Woven fabrics are created with criss-crossed fibers; their edges fray easily but they are easy to work with in other ways. Knit fabric, on the other hand, is created with fibers that loop together and do not fray easily. This is when you sew backward over an area you’ve already sewn so that your stitches get locked into place. This flat piece of metal is curved upward at one end and has a slot in the middle through which the machine’s needle moves up and down. This foot holds your fabric in place and helps guide your work. There are many types of presser feet, each with specific capabilities for specific jobs. A small blade attached to the machine which allows you to cut your thread quickly and cleanly. Allows you to control the speed of the machine with foot pressure. This metal part sits beneath the stitching plate and moves up and down as you work to help move the fabric along so you don’t need to guide it by hand. Located at the back end of the machine, the hand wheel allows you to manually move the needle up and down for slow, precision stitching or adjustment of needle height. This piece of metal at the top of the machine holds your spool of thread in place so that it can feed thread through the various loops on the outside of the machine and, eventually, into the needle. For every type of product we feature on this website, we recommend that you weigh its price against your own budget. It is very important to consider how much you’re willing to spend when you’re looking to purchase a product that’s available in a large number of types and, thus, a wide range of prices. Sewing machines fall into this category: on this page alone, you’ll find prices as low as $80 and as high as $1,000. Knowing your budget before you begin looking at your options will help you stay objective as you inevitably find yourself tempted with fancy features and useful extras. Remember, though, the more you pay, the higher quality machine you are likely to get. Beth Fernier of Craftsy suggests figuring out your maximum budget and then finding the highest quality machine for that price, even if it means that you won’t get quite as many bells and whistles as you would on a similarly-priced but lower quality machine. Other than budget and quality, there are a few major things you should think about when looking at purchasing a new sewing machine, even before you look at all those fancy extras we will discuss below. First, you need to consider the number and types of stitches your machine is capable of creating. Do you need a machine that does basic stitch-work for garment and curtain making, or do you need something that can create special stitches for quilting designs? Most people really need only two stitches to accomplish most basic sewing tasks like hemming and repairing holes: straight and zigzag. So, if you need to temporarily hold your work together, you’ll want a machine capable of basting stitches. Medium/regular length stitches are perfect for most regular jobs. Tight, short stitches work well in projects like pillows and stuffed animals, which are bound to take a bit of a beating after they’ve been created. Among the machines we have listed here, the number of stitches they can create ranges from a single type all the way up to 130 options. It is important to know what type of stitches you will need for your projects so that you don’t buy something insufficient or get talked into buying something more extravagant than you need. When the value of the sewing machine was first discovered, 200 French tailors actually took to the streets to riot against it. They saw its household usefulness as a threat to their livelihood. If you sew often, you will be happy to hear that investing in a new sewing machine will add hours of enjoyment to your life, as you can accomplish many tasks in the time you will save by performing your sewing duties mechanically. Despite the great many specialty and decorative stitches built into some modern machines, you really only need two stitches to accomplish most basic sewing tasks – straight and zigzag. The average sewing machine can handle about 640 stitches per minute (though some newer ones are even faster). By comparison, a human being can only perform about 23 stitches per minute by hand. This shows how much time and effort you can save by purchasing a sewing machine. If you are able to spend a little extra cash on your sewing machine, you can score yourself some great features without having to compromise on the quality of the basic appliance. Let’s talk about two of our favorites – automatic tie-off and automatic needle threader. Special features of this kind often sound like fun, but aren’t really necessary for most people. If, however, you use your machine on a regular basis, speeding up routine tasks a little with automatic functions like these can make a big difference in the amount of time you actually spend sitting in front of your machine. An automatic tie-off is when the machine automatically does your back-stitching. Instead of manually working backward after activating the backstitch function, you can allow the machine to backstitch a pre-determined number of stitches for you. This helps keep all backstitching uniform – none of your seams will be longer than the others. An automatic needle threader does just what you think it should – it threads the eye of the needle for you, saving you time and frustration. While this is a fun feature and it’s always nice to make your life easier, the cost of an automatic threader usually outweighs its potential benefit. If you see that the threader adds to the cost of your prospective machine, you may want to consider passing on it. If, however, you can get this feature for a good price, it’s at least something cool to brag about to your friends. Adding a digital controller to a sewing machine can allow you to program specific stitch sets and to select among hundreds of different stitch options. Sometimes, however, the computerization simply takes the stitch options from being printed on the side of the machine where you select them with a dial and puts them onto a screen where you select them with the press of a button. It’s very important, therefore, to figure out if such a machine is actually capable of what you need before selecting a computerized machine. What’s In a Presser Foot? A presser foot is the metal piece that holds down your fabric as you sew. What many people don’t realize is that several different types of presser feet exist and each has its own uses. A regular presser foot simply keeps your material from sliding around as you work. A special zipper foot helps you install a zipper in a garment without getting hung up on the teeth of the zipper itself. Some presser feet help you create buttonholes and circles, while others have slicers attached to trim the edges of your material as you work. Depending on the machine you select, it may come with multiple types of presser feet. The most important thing to consider is whether or not you will ever need to use more than one type of foot. If there is even a slim chance that you will, we suggest finding a machine which is, at the very least, capable of having the standard foot replaced if you purchase an extra one. Now that you’ve spent all this time learning about sewing machines, we hope you’ve been able to put that information to good use in making your sewing machine purchase. If you haven’t been able to make up your mind as of yet, though, we encourage you to remember your unique sewing needs as you move forward toward exploring more options.